As Antibiotic Resistance Spreads, WHO Plans Strategy To Fight It : Goats and Soda The problem has gotten so bad that some doctors are pondering a "post-antibiotic world." The World Health Organization says countries need to boost surveillance for resistance and develop new drugs. Patients receive treatment at the Chest Disease Hospital in Srinagar, India. 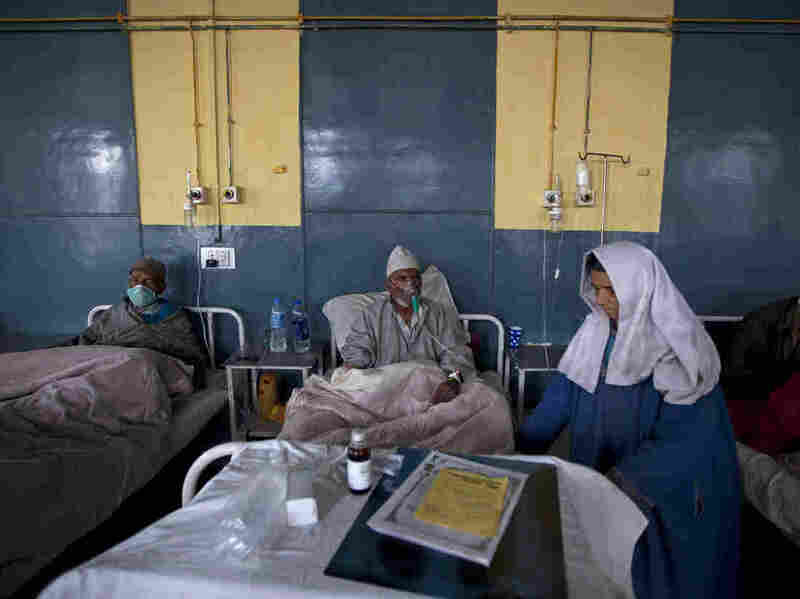 The country has one of the highest rates of drug-resistant tuberculosis in the world, in part because antibiotics for the disease are poorly regulated by the government. The world is losing some of the most powerful tools in modern medicine. Antibiotics are becoming less and less effective at fighting infections. The problem has gotten so bad that some doctors are starting to ponder a "post-antibiotic world." Common infections that have been easily treatable for decades could become deadly if the current growth of antimicrobial resistance continues. "Globally this is a really big issue," says Keiji Fukuda, assistant director-general for health security at the World Health Organization. "We are seeing the same patterns of resistance basically occur everywhere." In Europe alone, 25,000 people now die each year from infections that used to be treatable with antibiotics, Fukuda says. Some Staphylococcus infections acquired in hospitals have become almost impossible to cure. The pathogens behind malaria and tuberculosis are evolving to elude even the best treatments. "If we look at an infection like gonorrhea," Fukuda says, "there are several countries in which gonorrhea is now essentially untreatable by any of the available antibiotics. " When drug resistance develops in one part of the world, it tends to quickly spread, he says. At the WHO's annual meeting in Geneva this week, representatives from 194 countries approved a new global plan to counter antimicrobial resistance. The plan calls for every country to have a system in place by 2017 to monitor for drug resistance. It also tries to reduce the use and misuse of antibiotics in health care settings and agriculture. The plan calls for more investment in new drugs. It even emphasizes the need to cut the incidence of new infections with simple measures, such as increased hand-washing in hospitals and clinics. Fukuda underscores that this is not just a problem in developing countries. "People in the U.S. are no better off [regarding antimicrobial resistance] than people in other parts of the world," he says. Drug resistance, he says, is one of the biggest health threats of the 21st century, and the consequences could be grave if this trend isn't reversed. "People are going to find it much more dangerous to have surgery," he says. "If you have cancer or diabetes, and you're more susceptible to infections, it means you're going to have a much smaller safety net."